A powerful Great Nature GB8 G Unit appears who lets you throw everything away to unleash a deadly all-or-nothing charge. 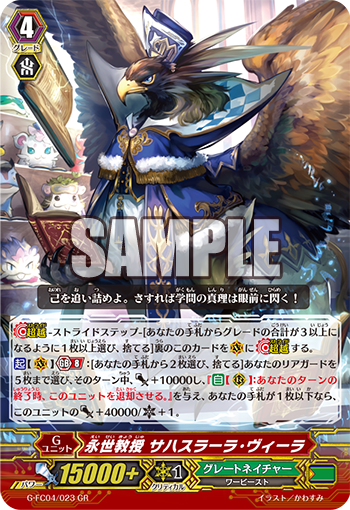 ACT (VC) Generation Break 8: [Choose 2 cards from your hand, discard them] Choose up to 5 of your Rear-guards, during that turn, they gain Power+10000 and “AUTO (RC): When your turn ends, Retire that Unit.”. If you have 1 or less cards in your hand, this Unit gains Power+40000/Critical+1. For Today’s Card we’re introducing the 《Great Nature》 Generation Break 8 G Unit “Eternity Professor, Sahasrara Vira” from the “Fighters Collection 2017” (on sale May 12nd, 2017). “Eternity Professor, Sahasrara Vira” is a superpowerful G Unit that strengthens all of its allies. Its Act ability lets you discard 2 cards from your hand to choose up to 5 of your Rear-guards, and in exchange for having them Retire at the end of the turn, they all gain Power+10000! And since it has no once per turn restriction, you can keep activating it as long as you have a hand. The Units you strengthen, such as “Crayon Tiger” or “Contradictory Instructor, Tusk Master” can Stand again for multiple attacks, while “Lesser Writer” has 『Resist』, resulting in being to apply incredible amounts of pressure on your opponent! And when your hand is 1 card or less, this card’s Power increases by 40000 and it gains an additional Critical. By continuously activating this card’s effect until you have 1 or less cards in your hand, you can launch a powerful attack.